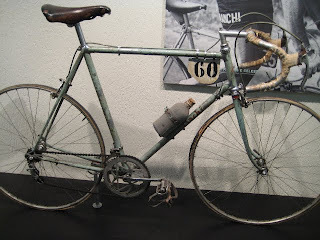 Well I guess this had to come at some point- Il Campionissimo's Bianchi. Credit due to Rouleur for bringing this one to the table, in the absence of a visit to Treviglio. The man is an obvious legend for his exploits on the bike, but in the history of cycling, can there be a better example of brand promotion through user endorsement? Think Coppi, think Bianchi. Think Bianchi, think celeste green. And over 50 years on, books are still being written about Coppi, Bianchi still makes bikes in celeste and they still sell. 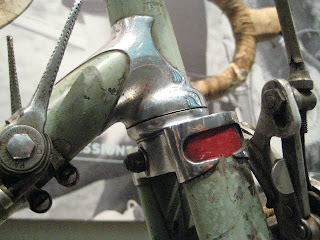 The bike itself has evidently seen better days, but it seems fitting that it sits 'unrestored' in the Bianchi factory as a genuine slice of history. For all it's significance, I fail to get as excited about this bike as something like the Merckx Colnago, with the exception of one detail: the headtube / headset / fork crown interface:- just a stunningly beautiful piece of artistry. Form meets function in the most glorious way. Some more nice photos and Coppi tales here.